This all started out because a friend of mine had made her Granddaughter a dress for her Barbies. 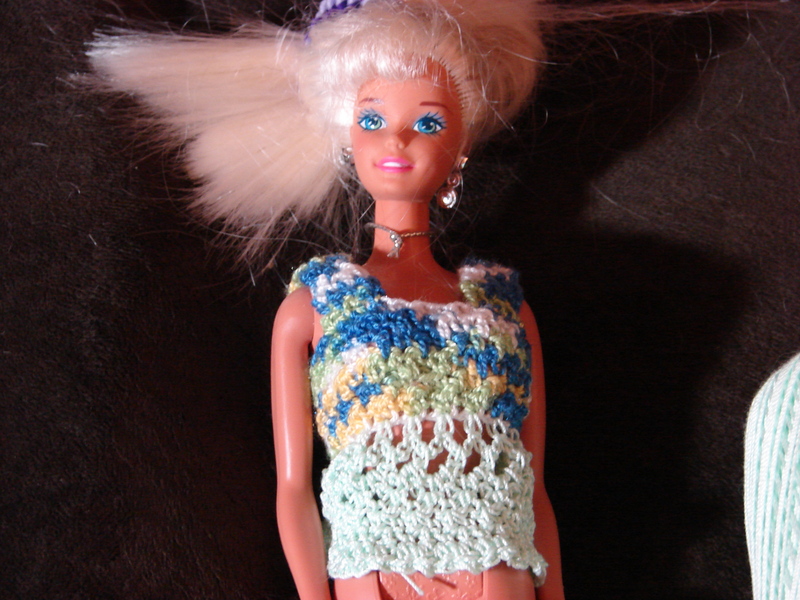 It got me to thinking how difficult could it be to crochet Barbie clothes. I have to admit I did some research and looked up what others had designed. I found a pattern and tried my hand at it. Here is the finished dress below! Once I accomplished that dress my mind went into overdrive, which happens quite often with me on anything to do with crafts! lol Now that I have gone off on a tangent back to the original thought! I started to think that I could design something myself for Barbie. 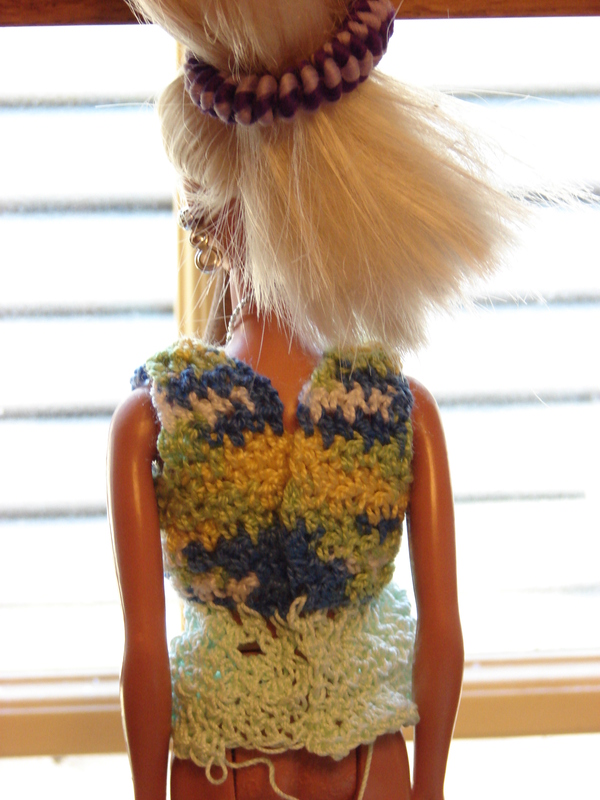 Once I finished the dress above I understood what was needed to make clothes for Barbie. Having sewing experience making my own clothes helped. Below is what I have started on another dress for Barbie. My thought for the dress is to make it a full skirt and be lacy on the bottom half of the skirt. For the top I had chained enough to go around just under the breast and overlap a little on the back and continued back and forth for 6 rows and then started to work on the back. Both dresses are made from size 10 cotton thread and I used a size 7 hook on the purple dress and a size 1 for this dress. I then continued the pattern for 6 stitches and worked them back and forth for 2 more rows and at the end of the next row and started to decrease stitches each row until I had a total of 3 stitches and fastened off. I then did the same for the other side on the back. For the front I skipped 6 stitches for the arm hole and attached with a slip stitch and continued pattern for 4 stitches and continued the pattern for 2 rows. The next row I decreased once and then continued the pattern for 2 more rows and fastened off. I then proceeded to do the same for the other side on the front. I then sewed the shoulder seams together. This is another view of the front of the dress. 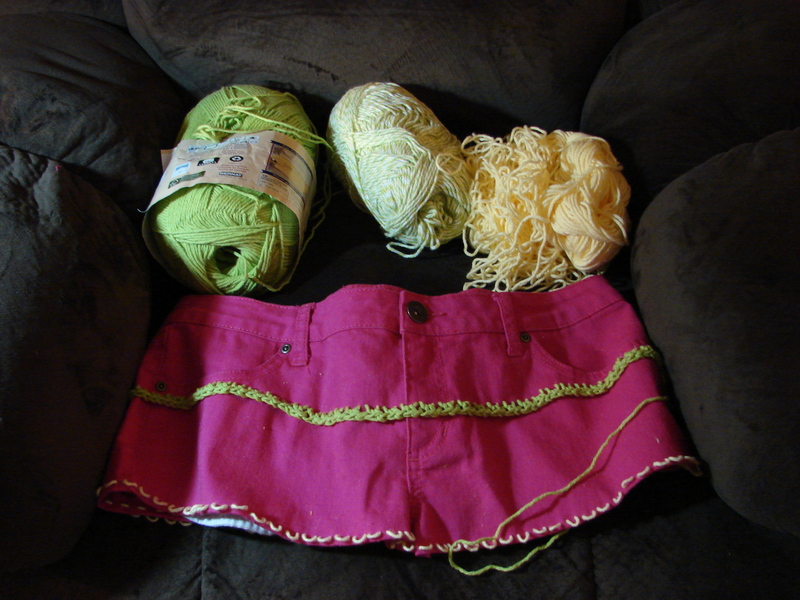 After I sewed the shoulder seams together I was ready to continue on with the bottom of the skirt. I attached the thread to the back and just chained 4 and skipped 1 chain and sc in the next chain on the bottom of original chain from the top part of the dress. I then worked that across, turned and chained 4 and sc in the next ch 4 space and across. After the open chain work I then proceeded to start the pattern back up for 2 rows. The next row I slip stitched them together in the back and continued working the pattern in Rnds. I am now at the point where I increased all around and that is where I left off. 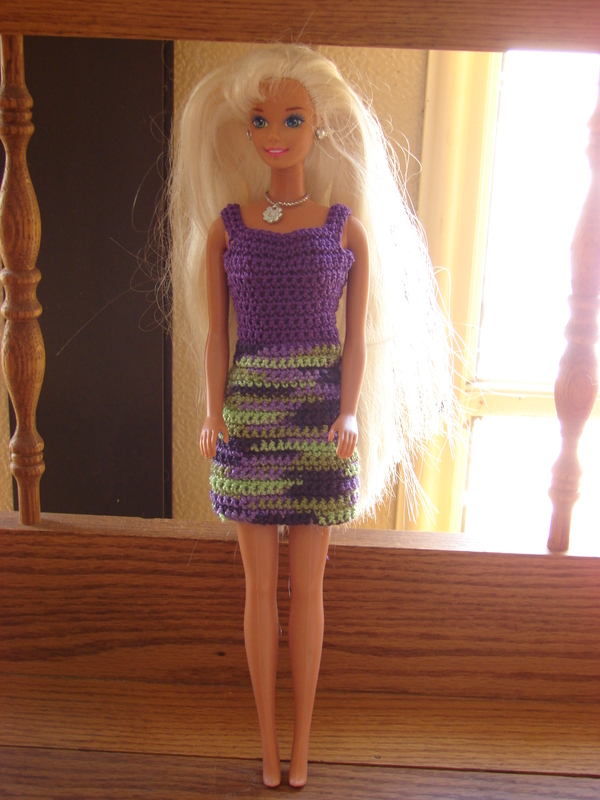 I do believe I am going to have a lot of fun designing Barbie dresses for my Granddaughters. 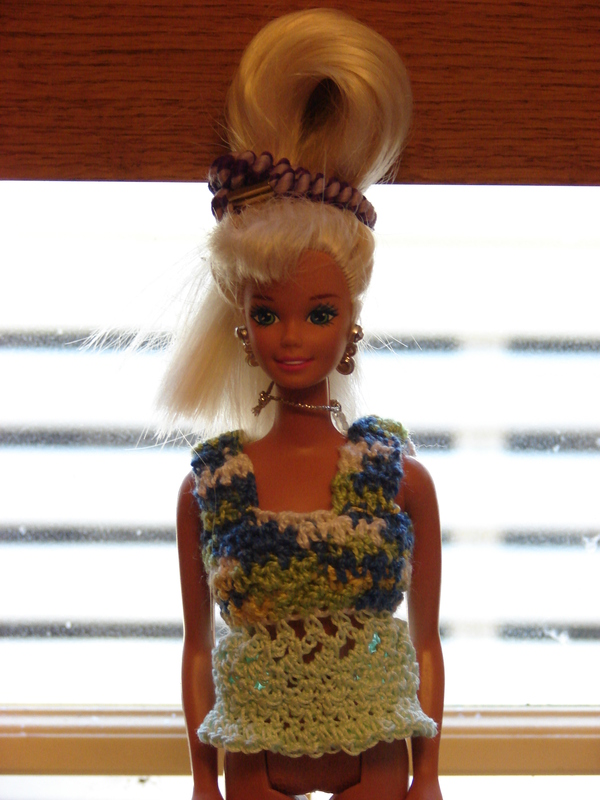 I love making things for my Family and with the Barbie clothes they are smaller, so I am able to finish a project sooner than I do with the full size clothes. I can not wait to see their faces when they receive the Barbie clothes. As I finish the dress I will post pics so you can see what progress I have made. Here is another link for some free patterns for Barbie clothes for those of you that are interested in making any yourself. Crochet Pattern Central – Free Barbie Crochet Pattern Link Directory. Thanks for taking a look and coming along with me on my creation of Barbie Clothes. If you have any questions or any ideas you would like to share feel free to comment! Making of A Bag from Old Jeans continued! Here is a look of the Bag I am making from an Old Pair of Jeans Continued! 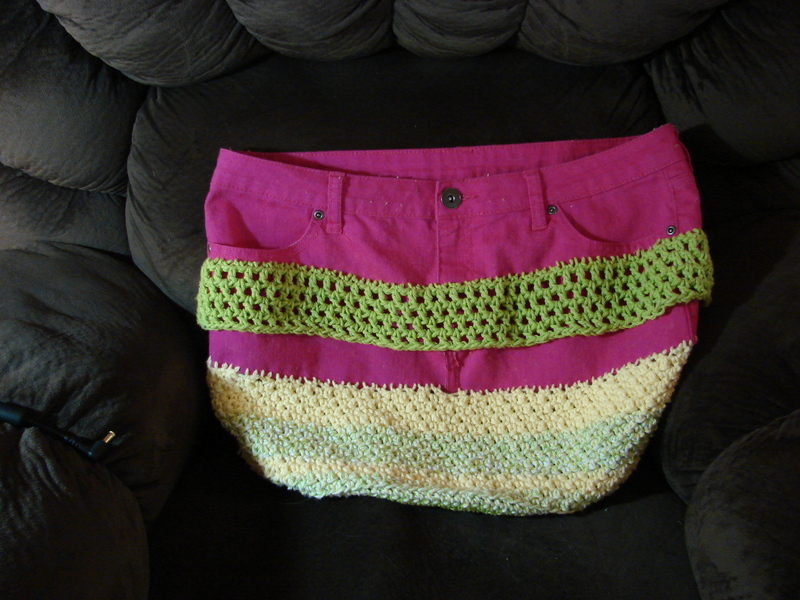 I added the lower part of the bag by crocheting around the loops I had attached on the jeans. 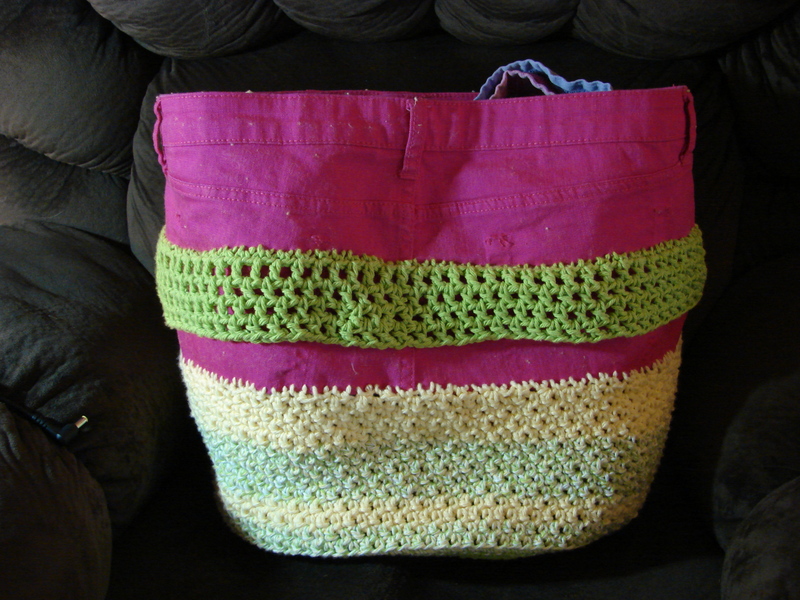 The bottom I created by crocheting in the back loop of the round where I wanted the height of the bag to stop. 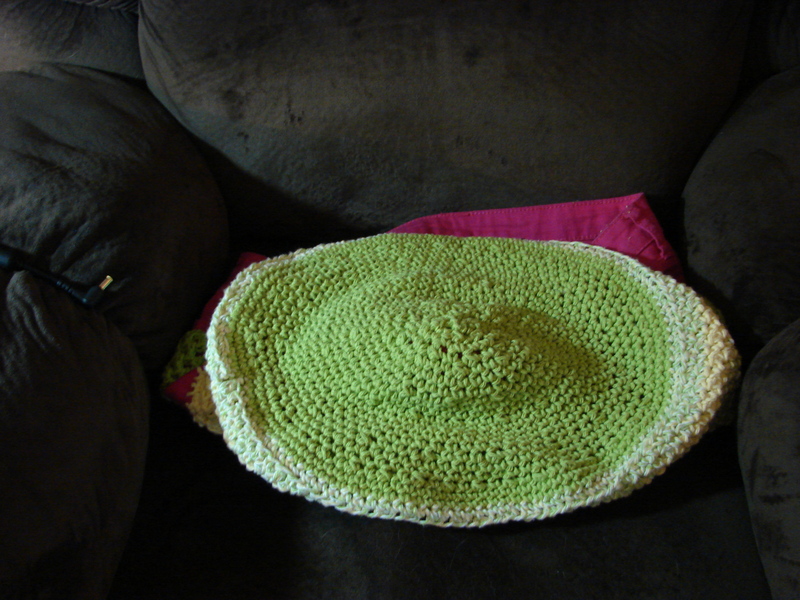 I then proceeded to keep crocheting around and started to decrease the stitches until I was able to close up the hole and fasten off. Here is the back and front view of the bag. . 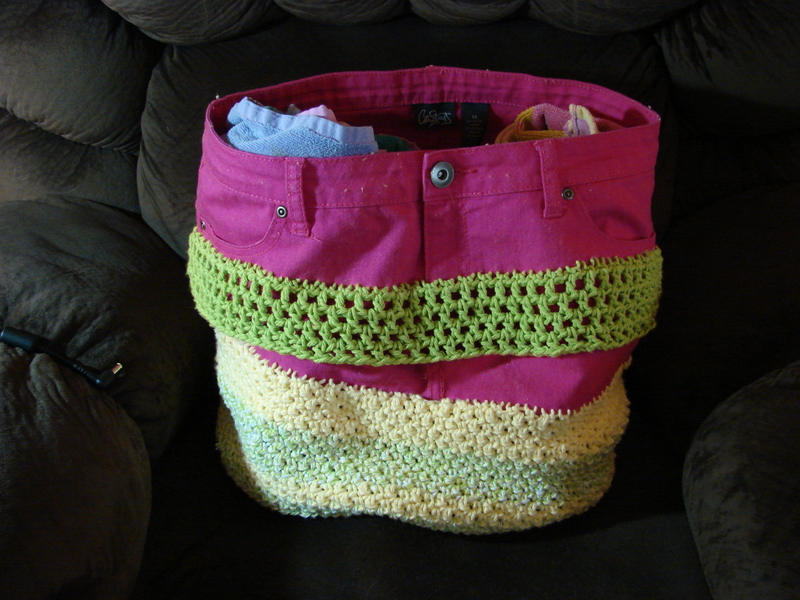 I do plan on using this as a beach bag so I thought it was a good idea to fill the bag with beach towels to show you what type of shape the bag will take on once it is filled. I am happy so far with the way this bag has turned out. It has a lot of room and I know it will hold what I usually take to the beach! You of course could always use a bag like this for a Market Bag. I am still in the process of making the straps or handles for the bag! I have thought about crocheting all three colors at once together or even braiding them together. Hmmmmm not sure yet what I will do! 🙂 If you have any ideas for straps or handles be sure to leave a comment below. I love getting input and ideas from people!! Thanks for stopping by and taking a look! Hope you All Have A Fabulous Weekend!! I have had this idea in the back of my mind for a while now. I thought I would try and see what I could do to combine my love of crocheting and the use of some jeans that I am not going to wear anymore. My mind was going round and round with ideas on how to accomplish this task! My first task was to cut up the jeans but I did not want to do any cutting until I had an idea of what I wanted to do. Lets just say I did cut the jeans but did I know exactly what I was going to do? Not really!! Pictured above is what I have gotten done so far. As you can see I did cut the jeans off and left the front pockets in tact. I did remove the back pockets of the jeans. The yarn that I am going to use to crochet on the bag is Bernat Handicraft Cotton. The colors of cotton thread that are pictured are the ones that I am going to combine together to make a Bag. In my minds eye I see this as a Beach Bag! I love the bright colors and they bring to my mind a day of being at the beach. Of course this bag will be big enough to use for a market bag, an overnight bag or as a big purse! The bag so far is 18″ wide. I am uncertain at this time as to what the length of it will be. In order to crochet onto the jeans I took some of the cotton thread to make loops all around the jeans. I will post more pictures as I continue to progress on this project. Here is some more ideas on what do do with jeans! 19 Things to Do with Old Jeans | FaveCrafts.com. If you have any fun ideas on how to reuse old jeans please leave a comment below. Thanks for stopping by and taking a look! A Drawing Give Away for a Crochet Harry Potter Sorting Hat! 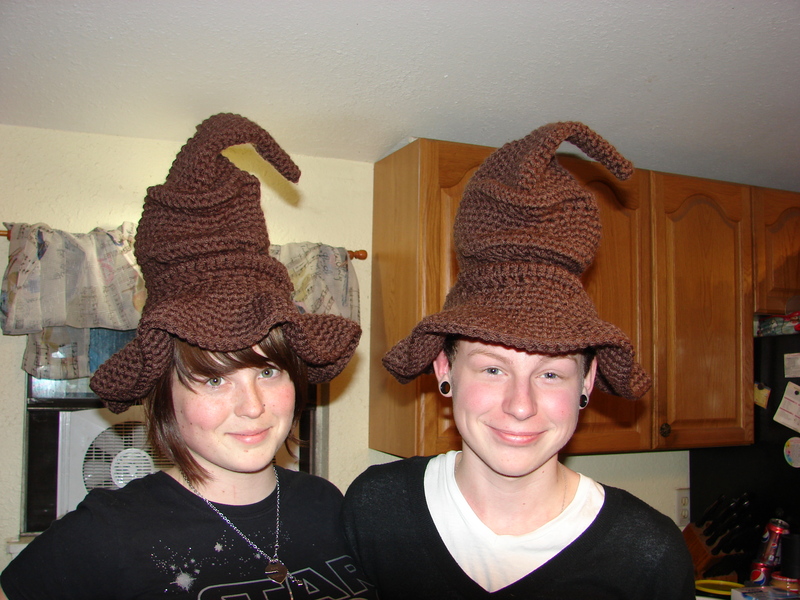 Crochet Harry Potter Sorting Hat Give Away Drawing! Want a chance to win this hat? For Specific Details hop on over to my Facebook pg at Dunmire’s Crochet Corner to enter into the drawing! The give away drawing will be running Feb 6th through Feb 8th. On Feb 9th I will announce a winner!